When given an option between steamed or pan-fried dumplings a.k.a potstickers, I always go for the pan-fried ones. They stick to the pan while cooking, and hence the name. Contrary to the term fried, they are not that fatty. For an extra spritz of oil, the dumplings are crunchy on one side, adding a new dimension. Having said that I still like steamed dumplings. This is just for a change. Since there is not a whole lot of flavour going on with the wrapper, I kept the filling fresh and crunchy. The veggies are barely sautéed, and the cabbage is added at the last minute. The residual heat is just enough to cook it. The filling is mildly seasoned and hence the flavour comes from the veggies only. They look and taste delicious and you can gulp down a dozen of ‘em in one sitting. But this is not one of those recipes that you do when it is almost meal time. It requires some planning and assembling, because shaping the dumplings takes some time. You can definitely make ahead and freeze ‘em and cook just before serving. Reserve some shredded cabbage, carrots and bell pepper for plating. Put a wok on high heat. Add oil and quickly stir fry carrot, bell pepper with green chilli, ginger and lemon grass, for about a minute. Season with soy sauce, salt and pepper. Switch off the flame and mix the shredded cabbage. Mix thoroughly and set aside. Take 6 wonton wrappers at a time and form an assembly line. Brush the edges with water, place a tbsp of filling in the center, and fold as a square or a triangle. Pinch the edges and transfer the finished wontons onto a baking sheet and keep them covered with a kitchen towel. Proceed to finish the rest. Take a flat pan with lid and put it under medium heat. Spray the pan with a tsp of oil and place 5 or 6 filled wontons without crowding the pan. Don’t disturb the potstickers for a whole minute. After they have crisped on one side, gently pour ¼ cup of water in the pan and close the lid. The steam from the evaporating water will cook the potstickers. When all the water has dried and the wonton wrappers are transparent, they are done. Gently transfer onto a platter prepared with the reserved vegetables and serve immediately with your favourite dipping sauce. 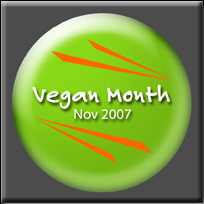 If you would like to send in your entries for Vegan Ventures, hurry up, there is only a day left for submission. 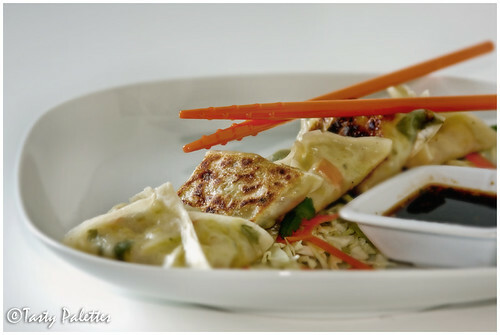 These look delicious, I definitely lean towards pan-fried potstickers too - love that crunchiness. I am so impressed that you make these! I love them but have never tried to make them. There are some excellent ones in China Town at Mandarin House and I always order them when I am there. can i just say delicious!! They look lovely. Only pity that they take longer to make than eat!!! I made these over the weekend too inspired by Nupur's earlier post and really liked them. love your simple dishes! !I am gonna give it a try!! Suganya, as always your pictures are drool worthy buddy. Makes my mouth water every time I visit your blog. Vegetable potstickers look yummy. Enjoy your weekend. I see that you are in an international cooking spree. Thai, mexican and now Chinese. Looks so delicious as usual. Never tried them before. Thanks for sharing. Wow looks amazing suganya! 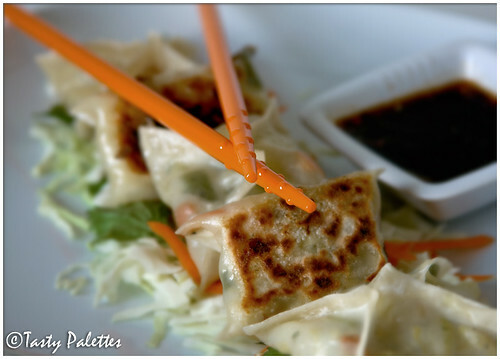 mouth watering potstickers! Great recipe. Thanks for sharing dear. I have to get back to the pics again!! Ooh goodie goodness. What a wonderful shot. Nice picture.I guess the dish might taste even better. These look SOOOO yummy! I agree that pan fried is far superior to plain steamed. It adds another dimension to the dough. I will definitely have to make these. Thanks for the inspiration! I would take these over steamed ones any day :). Such wonderful pictures, Suganya! 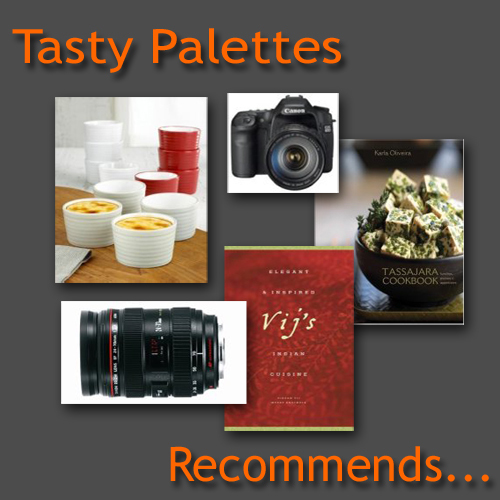 As usual, you gave us a lovely recipe and drool-worthy pictures :). All i can say... a big YUMMMM.. I ahve a nepali freind she made this for me.. it was really good! You know how to play with the colord.. love your pics! OMG!!!! What a picture... Really really nice. gosh those are real lovely pics..feel like I can eat off the screen!! Stunning picture!!! Looks really really delicious! I do so love pot stickers, and I thoroughly enjoy them as steamed dumplings too. They are always filling and satisfying. They look gorgeous. I have never had potstickers, but I like the idea of them being crunchy on one side. Would surely like to try them at some time.